Bengaluru, March 20: One more body was recovered on Wednesday from the site where an under-construction building collapsed in Karnataka's Dharwad on Tuesday, taking the death toll to three. As many as 37 people have been rescued so far. NDRF and SDRF team were at the collapse site to carry out rescue operations. Some people are still believed to be trapped under tonnes of cement and mortar. Oxygen and water is being given to them. 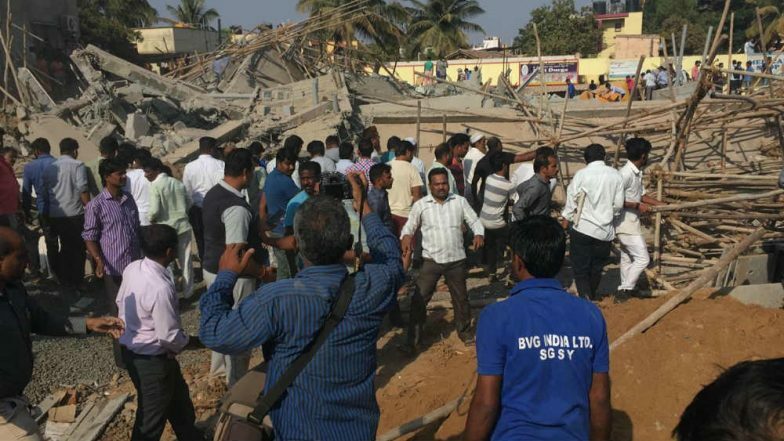 Several people were trapped under debris after a four-storey under-construction commercial complex building collapsed in Dharwad's Kumareshwar Nagar at around 3.50 pm on Tuesday. A total of five fire tenders and 10 ambulances were deployed to carry out the rescue operations. 43 people were admitted to the Civil hospital while 13 people have been referred to KIMS and SDM hospital, said Giridhar Kuknoor, District Surgeon Dharwad. State unit Congress leader Vinay Kulkarni's kin was one of the owners of the building which was under construction. The cause of the collapse was not known. No case has been registered so far.